You may remember that, almost a year ago, I reviewed Accurate Tuner Pro here on AAWP? I rated it highly, but there have been plenty of new competitors, of varying degrees of quality, released since. 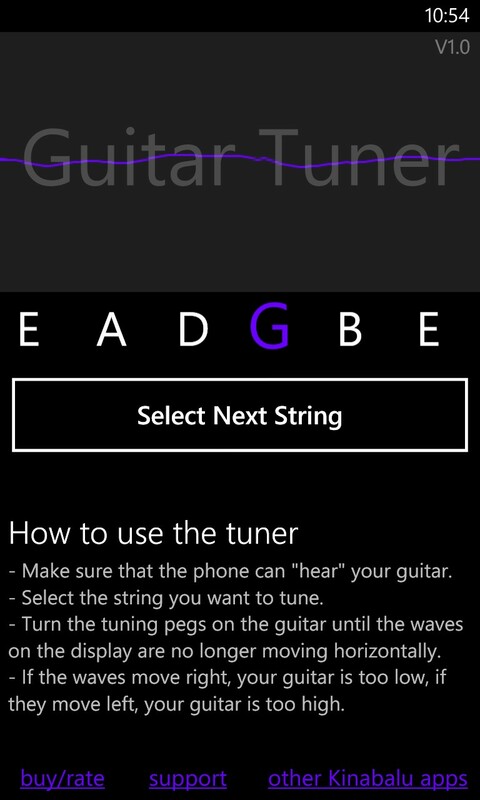 In the spirit of starting 2014 with options for you, the Windows Phone enthusiast (and musician), here's my round up of tuning utilities for the platform - for the guitar, at least. Other instrument round-ups may follow in due course! Before delving into what Accurate Tuner Pro (ATP) does, I should go a little philosophical, noting that there's a distinct benefit to staying 'old school' and low-tech, in that sampling tuners reduce tuning each string to tweaking the tuning pegs and watching the fancy animations - you essentially stop fiddling when the display says so and never mind how the string sounds. Ultimately, as a player, you want to improve, but you also want to improve your musical ear, I'm often appalled by the numbed of players who carry on strumming something which is obviously out of tune because they just can't 'hear it'. I should emphasise that I haven't got 'perfect pitch', but I can recognise when a note's not 'right'. In part this is because I've usually tuned my guitar by ear, playing a tuning fork to get a reference tone and then tuning by harmonics across the strings, or by playing the appropriate notes on a nearby electronic piano or organ and tuning to those. 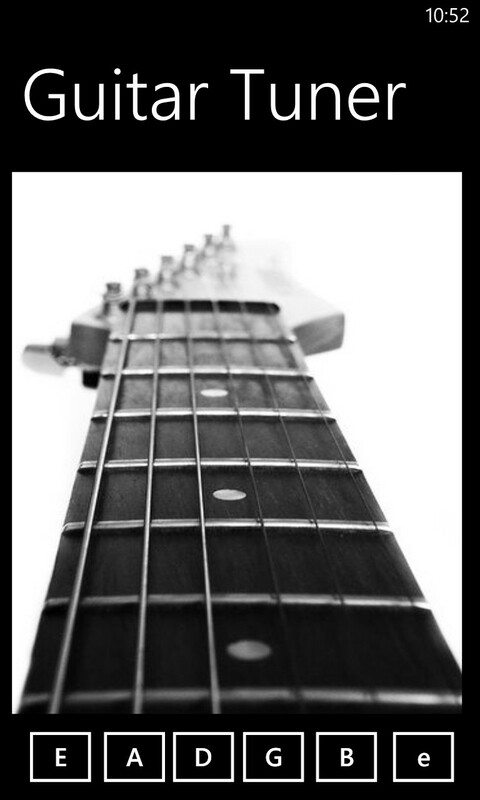 Even with ATP, after tuning across all the strings, my guitar didn't sound 'right' - every guitar has its own little, miniscule idiosyncrasies, i.e. no instrument is perfectly intoned. By tuning by ear, I was able to make these little allowances as I went. The argument against tuning using reference tones, by ear, is that 'on stage' (i.e. in a noisy and busy environment), it's hard to hear accurately enough to make the needed changes. By plugging your instrument into an electronic tuner, you can interface directly with a tuning engine and get accurate pitch even if Motorhead are playing on the other side of the room. 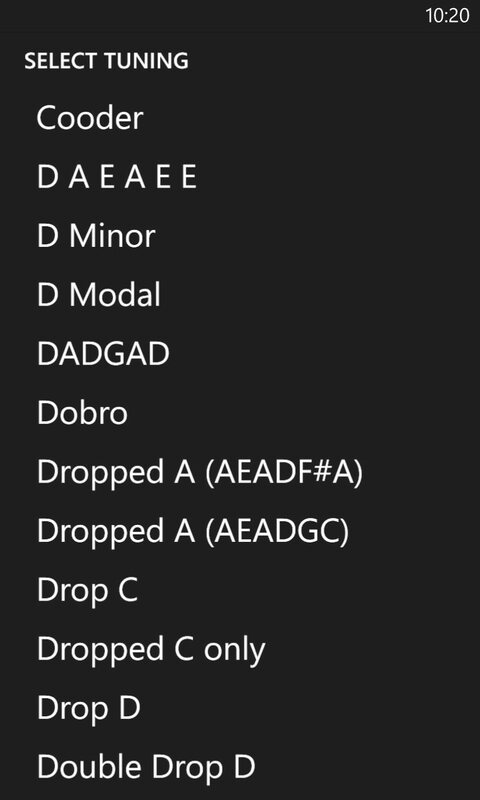 This then is the big selling point of sampling/'chromatic' tuners - except that here, on your Windows Phone, you can't plug your instrument in - you're reliant on the microphone - which brings us back to problems in noisy rooms: in this case, the software having to pick individual frequencies from a barrage of sound. Which often doesn't work very well. 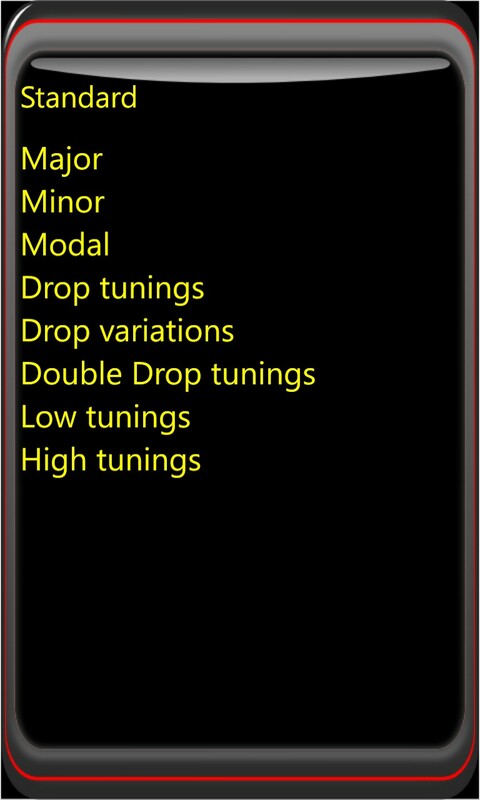 The Rolls Royce of tuning applications, and suitable for every other instrument on earth, thanks to options for every musical and tuning system (for guitars, above, right) known to man. 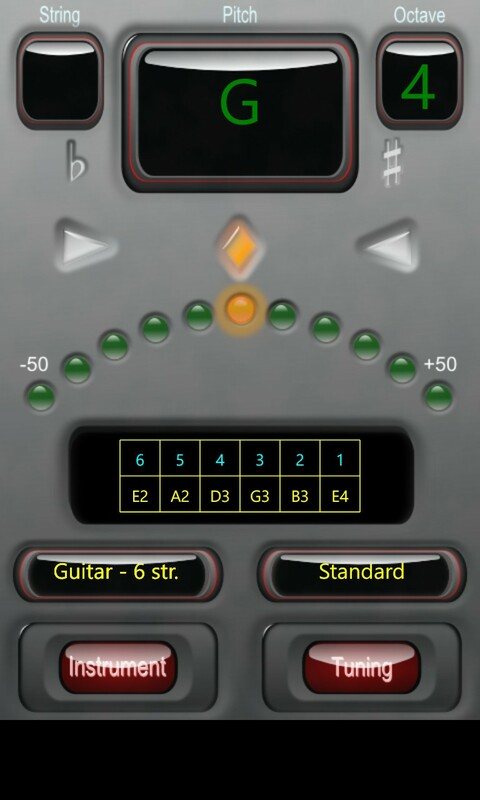 For guitarists, the chromatic tuner works brilliantly, with the orange panel (above) glowing green when the note's nominally "in tune". Gloriously over the top, but also gloriously configurable and effective. 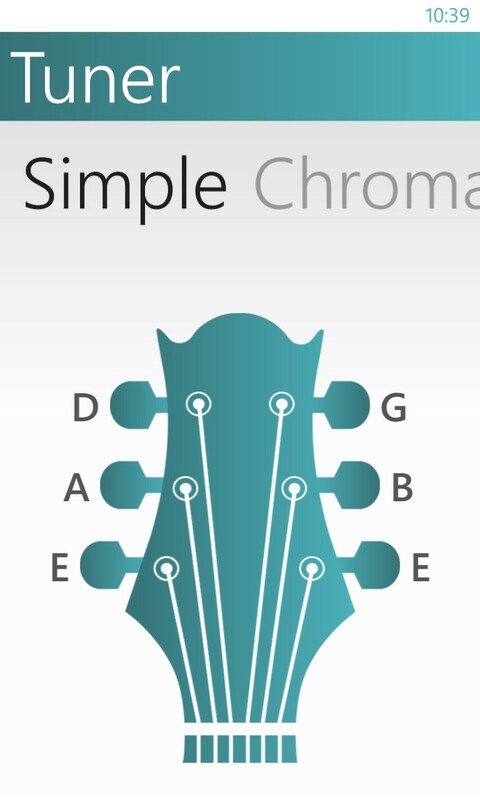 Plain and simple, as far from Accurate Tuner Pro as it's possible to get. 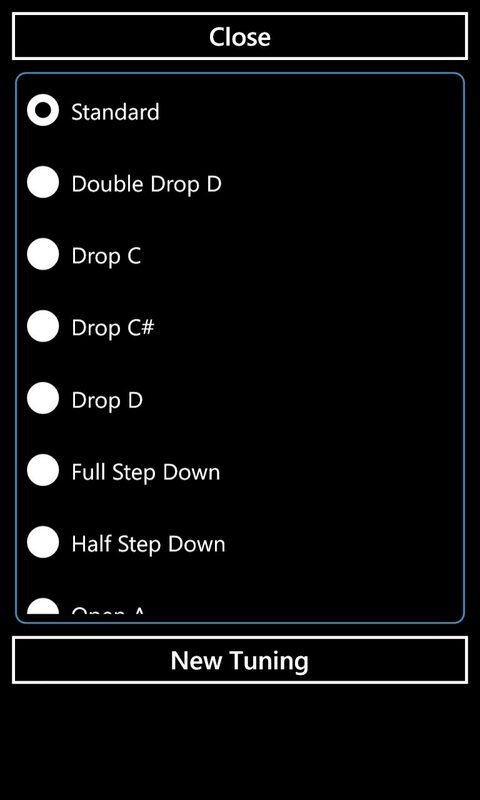 Set this to 'repeat' and then tap the string letter you want and twang your own instrument strings until they sound the same as the samples coming from your phone speaker. Your own musical ear is the key here, and this utility will help train it. 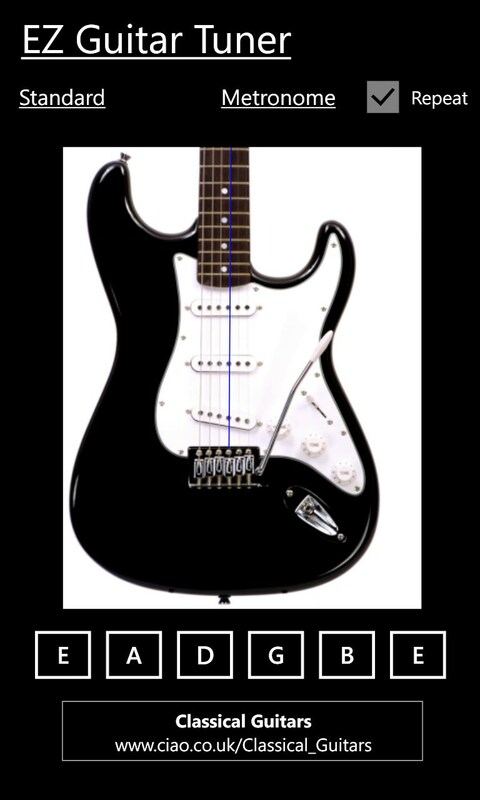 As the name suggests, chords, scales and metronome are all included here as well, but the tuner part is also effective. The neon blue indicator moves left and right and glows green when you're in tune - the big red button switches the bottom display from waveform mode (shown) to frequency analysis. Also included (shown right) is a manual 'by ear' tuner, though there's no auto-repeat system so you have to keep tapping manually. Again there's a wider range of functions, with chords, scales, metronome, an 'ear training' mini-game and a novel 'looper' that samples what you're playing and then repeats it over and over again so that you can 'play over the top'. The tuner has both manual (left) and chromatic (right) modes. Both work but are rather elementary, with no repeat mode and jerky display respectively. The first of three apps here with identical names (how on earth does Microsoft allow this? ), and a very simple 'by ear' tuner. No frills, no repeats, not even an animation in the main display. Very basic. Having to manually pick the string you want tuned seems like a backwards step, but in a noisy environment can help tune over a microphone, as here. Unfortunately, I hated the waveform-based indication system. The idea is to stop tuning when the waveform stops moving, but for me it was always moving. Ultimately clumsy and not recommended. 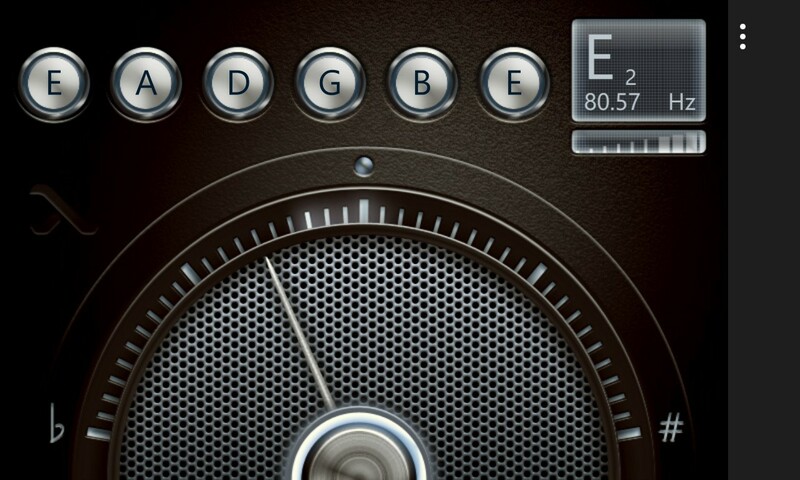 Mimicking a traditional electronic tuner very closely, Guitarist Tuner does rather well, with good auto detection and just enough help in terms of whether a note is sharp or flat, without confusing the user with too much fluctuation. 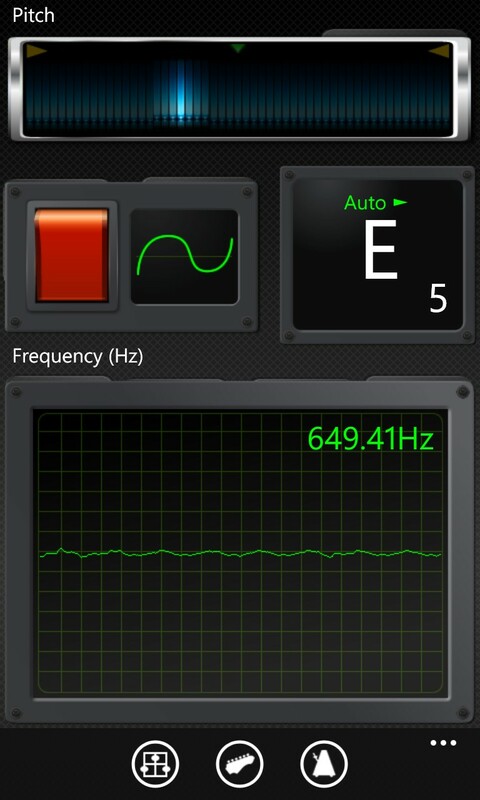 Tap through the instrument and tuning dialogs and there's masses of customisability here too. 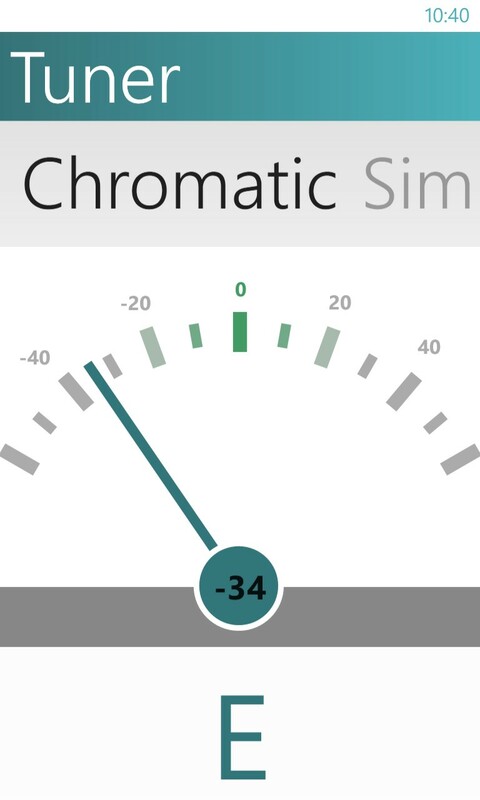 Almost the perfect chromatic tuner, and free to boot. I've tried to do a full sweep of the Windows Phone Store for the roundup above, but inevitably something may have got missed (three apps had the exact same name, and I found two more by the same name again while editing the text! ), so comments welcome. 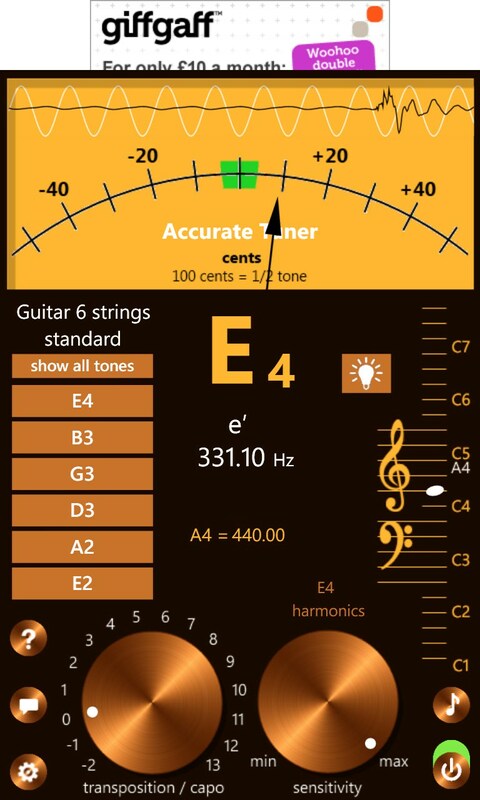 I'd recommend starting with EZ Guitar Tuner because I believe that it will help your musical ear more, while you tune, and as a result your 'imperfect' instrument can be finely tuned yourself to really 'sing'. It also has the advantage that you can plug in the 3.5mm output into an amp if you need the repeated reference string sounds amplified. 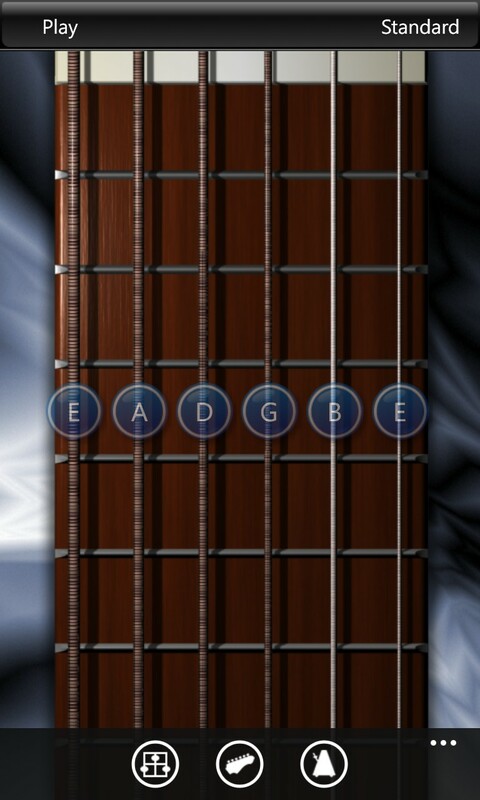 However, if your ear is having a bad day and you need some help then try Guitarist Tuner, which works well and also won't cost a penny. Several of the other tuners here offer more apparent sensitivity, but don't perhaps get you tuned as fast in the real world.